Laure Schaerr never anticipated that being the director of public affairs in her Cedar Rapids, Iowa, Stake would mean sacrificing not just her time but her garage as well. For the past several months, Schaerr has been storing a nearly life-size nativity set at her family’s home in Marion, Iowa. As the director of public affairs in her stake, Schaerr heads up an annual Christmas nativity exhibit at the local stake center. When she heard from a friend that Mulekoff’s, a local furniture store, was looking to find a home for a plaster nativity set, she consulted with her stake president. The nativity set used to be on display in downtown Cedar Rapids but was damaged during the 2008 flood. Like the innkeeper in Bethlehem, Schaerr and the Cedar Rapids Stake offered to take in the Holy Family and its accompanying entourage. Being a busy bishop’s wife, a mother of four and a homeschooler, Schaerr was determined to finish restoring the nativity set by the end of summer so she could re-focus on her family when the new school year started. But to do that, she knew she would need help. Schaerr told her stake president about her end-of-summer goal. “Well, let’s get you some people to work on it,” said her stake president. They asked for volunteers from the three wards in the Cedar Rapids Stake, and since that request was made, over 30 people have stopped by Schaerr’s garage-turned-restoration-workshop to help, including a retired neighbor who isn’t a member. One of these folks is Cary Jacobs, a Cedar Rapids native who has been storing the Joseph statue—the most damaged piece in the set —in her garage. She remembers seeing the set when she was young. “As a small child, it always looked larger than life to me. 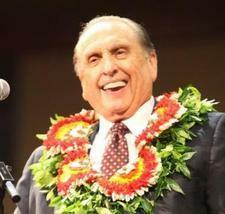 It was like a little bit of heaven on earth,” she said. Before malls encroached on the area, the shops and department stores in downtown Cedar Rapids hosted Christmas window displays. Cedar Rapids natives remember putting on their best clothes and strolling down the streets downtown, looking at the displays, listening to Christmas music, meeting Santa and drinking hot chocolate—all part of an annual Christmas tradition that extended for generations. 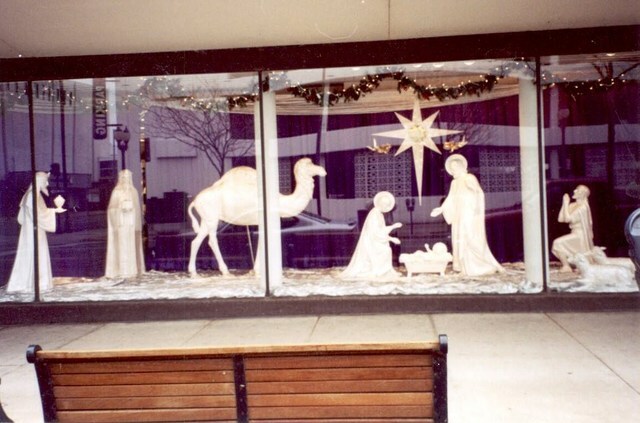 In 1959, when Armstrong’s—a local department store—moved and renovated its store to compete with nationally successful chains like Marshall’s, the store acquired a plaster nativity set (from Europe, local historians believe), which the store displayed that Christmas and every Christmas thereafter until 1991. Armstrong’s closed in 1991, and another local store, Mulekoff’s Furniture, acquired the nativity set along with a number of other fixtures from Armstrong’s. Though the owners of the store were of a different faith, they continued to display the set until 2007—the year before the June 2008 flood that damaged thousands of homes and businesses in Cedar Rapids, including Mulekoff’s. After the flood, a local newspaper reported the nativity set as being damaged beyond repair, yet the owners of Mulekoff’s continued to store the nativity set in their basement, looking for someone to give it a new home. “I think they sensed its importance in the community,” Schaerr said. Despite the grim prognosis made by that local paper, Schaerr and her team of volunteers nonetheless plunged in, doing Internet research and consulting with local artists about how to restore plaster. Much of the work involved cleaning the burlap and horsehair used to reinforce the plaster. Restoring the set also required hours of scraping paint, rebuilding missing fingers and chipped corners and applying layers of primer and base paint—as well as hunting around to find just the right off-white opalescent surface paint to match the original. It was a lot of work, and with ten pieces in the set, including a Joseph statue broken into three pieces, Schaerr has been grateful for the help she’s received on this project. The community has been very supportive. A local box company donated boxes large and sturdy enough for her to store the pieces in, and Mulekoff’s volunteered to transport some of the larger figures, including a camel that stands five-feet-nine-inches tall and seven-and-a-half feet long. Not only has Schaerr and the Cedar Rapids Stake successfully restored the nativity set, but they’ve accomplished Schaerr’s goal to have the nativity set completed by the end of summer. The nativity set will be on display December 3 & 4, 2010, in the Cedar Rapids stake center.